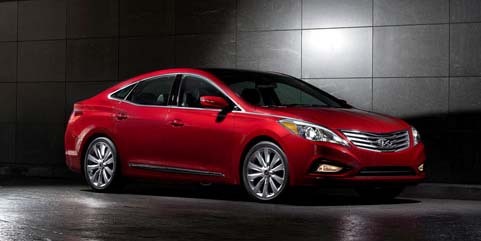 Hyundai’s team of designers and engineers deserve the accolades coming their way via the second generation Azera. Released in 2012 and further refined for 2013, Azera sets a very high standard for mid-sized sedans. Sleek, modern exterior appointments offer your eye a treat at every glance while not screaming to be seen. Gone are the days of soften corners, blended forms, and rounded everything in a hurry to look like a jelly bean. Good thing that. Also gone are the days of picking and choosing from a laundry list of trim packages that could boost the teaser base price into unaffordability. Hyundai has wisely gone the route of providing complete vehicles fully loaded with the only optional upgrade, as with Azera, being an enhanced technology package. Call it truth in advertising if you will, as the base price of $32,230 represents the actual price of the car. On the list of included items are such niceties as supple leather seats (heated & cooled both front and rear), navigation system, alloy wheels, Bluetooth connectivity, and a host of other features we used to pay separately for. Azera’s interior is very comfortable, practical, with all controls in logical locations and easy to use. Without prior knowledge, you could easily guess Azera’s price to be several thousand dollars higher than it is. From the leather wrapped steering wheel to the base materials in the door panels and seats, Azera welcomes you with that ‘touch of luxury’ we keep hearing about. Hyundai’s now-venerable Gasoline Direct Injection (GDI) technology delivers smooth, effortless power in all conditions. Azera is a front wheel drive car, but you have to push your driving pretty hard to realize it. With 293 horsepower and 255 lb.-ft. of torque, the 3.3 liter V6 responds quite predictably, moving the 3,700 pound Azera with ease. Our twisty Mulholland Highway test route proved no challenge to Azera’s handling. The typical companion to good road manners is a rough freeway ride. Not so with Azera. Both types of road are taken in full stride. You want a hot rod? Go buy a hot rod. You want mini-van capacity? Go buy a mini-van. You want a premium, great looking mid-sized luxury sedan that delivers more comfort, quality, and value per dollar than just about anything else out there? Go buy an Azera.